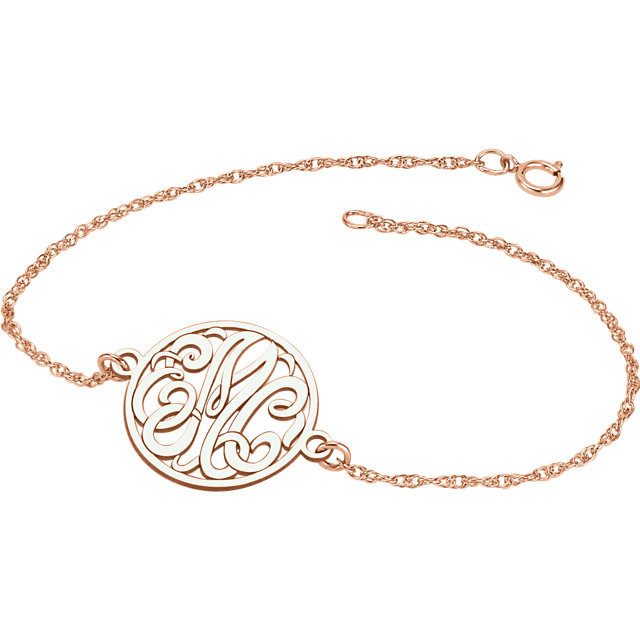 Beautifully feminine in rose gold, this personalized and custom monogram bracelet is truly one-of-a-kind and personalized with your initials in ornate, Script letters and held in place by a delicate but sturdy link bracelet. Make it your own. The traditional monogram displays your last name's initial at center with your first name's intial at left and your middle initial placed at the right. Some choose to also make these into husband and wife monograms, with their last name in center and each of their initials on each side. Or create a family monogram bracelet with your children's initials. Bracelet is available in 10k or 14k solid rose gold. You can also choose a 7" or 8" length. 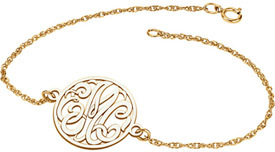 Please allow 7-10 business days before shipping, since each monogram bracelet is custom made to order. Ships free within the United States (international also available!). Also available in 14k yellow or white gold or sterling silver (shown below). 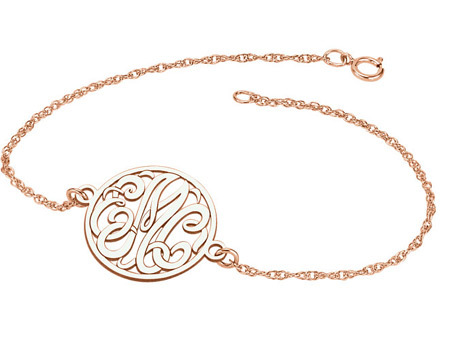 We guarantee our Rose Gold Personalized Monogram Bracelet to be high quality, authentic jewelry, as described above.